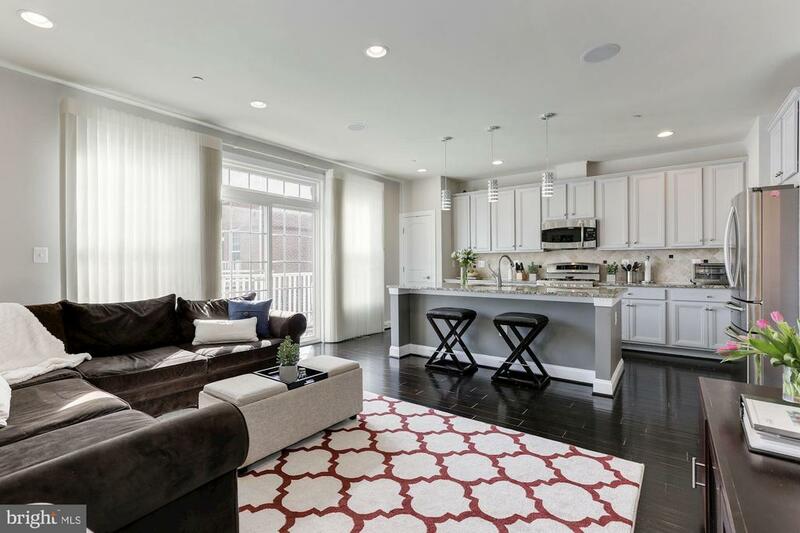 Welcome to 3910 madison mews, a well-appointed and sun-drenched townhome offering 2,750 square feet, 4 bedrooms and 3. 5 baths throughout 4 finished floors. With a contemporary, open floor plan that suits nearly every lifestyle, this attractive brick home is adorned with gleaming hardwood floors, classic crown molding, and large windows. The main level is wonderful for entertaining with a large living room that flows into a separate dining area. A bright family room is adjacent to the gourmet kitchen, a wonderful feature that keeps everyone together. Sleek and sophisticated, the gourmet kitchen is complete with granite counters, tile backsplash, gas cooking, stainless steel appliances, and a large center island with breakfast bar. The kitchen and family room opens to a balcony with room for a grill and herb garden. The first upper level has 3 bedrooms and 2 baths, including a gorgeous master bedroom that includes 2 walk-in closets and a spa-like master bath. The serene master bath showcases a dual vanity with granite counter, stall shower, and soaking tub. 2 additional well-sized bedrooms both have ceiling fans and nice closet space. The second upper level/loft level is comprised of a large recreation room accented with built-ins and an office nook. A fourth bedroom with private rear balcony and full bath are also on this level. With plenty of room for entertaining, the lower level showcases a second family room with gas fireplace, ideal for an extra play space, work space, or media room. Access to the attached 2-car garage is found on the lower level as well as room for storage. Downtown fairfax is a charming area in the city of fairfax that is laced with lively restaurants, trendy boutiques, and convenient services. 3910 madison mews is less than a block to old town plaza, a mixed-use destination that welcomes visitors with sidewalk cafes, free summer concerts, and a variety of businesses. Just a few blocks further is old town square, a central green space with a spray park that is beautifully maintained and hosts many city events including the fall festival, festival of lights, rock the block + more. A variety of commuter routes are nearby, making the drive to other parts of va, dc, and md easily accessible. Flexible on closing date. For more information or make an appointment to see property ID VAFC117834.